Many Christians are attending the Pentecostal Church in Indonesia (GBI). JAKARTA, INDONESIA (ANS – September 8, 2018)– Millions of Indonesians are becoming Christians, often secretly, but authorities refuse to recognize this trend in the world’s largest Muslim nation, several evangelical leaders have told BosNewsLife, a news partner of ASSIST News Service (ANS). 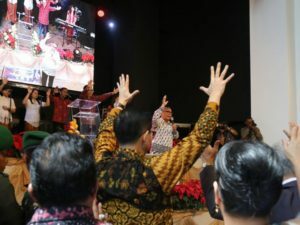 At least three to four million Indonesians “turned to Christ” over the past year, according to Christian officials with very close knowledge about the situation. All spoke on condition of anonymity as the issue of conversion remains highly sensitive in Indonesia, where dozens of people have been jailed or even killed on accusations of “blasphemy” against Islam. “Even if you see someone dressed as a Muslim, he or she may have become a Christian,” a seasoned evangelist said. In Jakarta, the capital, at least 40-50 percent of residents may be ‘Christian,’ according to church group estimates. It remains unclear how many of them are ‘born-again,’ a move that involves accepting Jesus Christ as “personal Lord and Savior.” Being “born again” is seen by many pastors here as the essence of Christianity. Muslims account for roughly 87 percent of Indonesia’s 260 million people, said the U.S. Central Intelligence Agency (CIA), but the agency cited government estimates from 2010. Also, it has now emerged that the number of Christians including Protestants (7 percent) and Catholics (2.9 percent) have been steadily growing. “We expect half of Indonesians to be ‘Christian,’ at least in name, within five to 10 years”, a senior church leader and evangelist told BosNewsLife. That could mean some 130 million Indonesians identifying themselves as ‘Christian’ by 2028. “There is a revival in Indonesia,” added the evangelist who has traveled through the most remote areas of Indonesia. Some “accepted Jesus Christ” as Lord because they saw or experienced miraculous healings during evangelistic outreaches, BosNewsLife learned in interviews. Christians, including former Muslims, also cite disappointment about Islam’s strict regulations and perceived lack of freedom as reasons to convert. However, opposition to Christianity encouraged by a growing number of Islamic militants and hardliners in Indonesia contributed to religious tensions, even within government institutions. The governor argued that people were being deceived if they believed the Koran forbids Muslims from voting for non-Muslims. 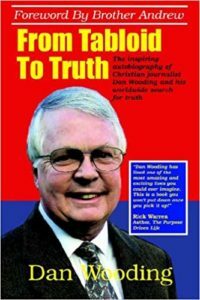 He also came under fire for often citing the Bible and his Christian faith in speeches, Christians said. “The case with the governor shows that being a Christian can undermine your career in Indonesia today,” a dedicated Christian woman and church worker told BosNewsLife. “That is perhaps why many Christians may even remain Muslim on paper,” she added referring to religious preferences on identity cards and other documents. 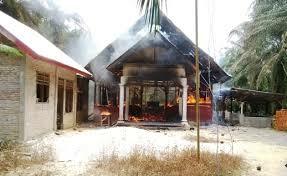 Churches have been bombed or torched in several areas of Indonesia. Indonesian President Joko “Jokowi” Widodo, who won the elections of July 2014 on a platform of renewal, has been criticized for not doing enough to tackle religious intolerance following church bombings and other ant-Christian attacks that have killed at least dozens of people in recent years. Also, with many Christians running major businesses, the Muslim president is under pressure to mend fences in what is one of Asia’s fastest-growing economies. However, the influential advocacy group Human Rights Watch (HRW) disagrees. “Kalla’s comments reflect the government’s willful disregard of both the corrosive influence of discriminatory laws that pose a clear threat to the country’s religious minorities, as well as official actions to reinforce those laws,” said Phelim Kine, the deputy director at HRW’s Asia Division. Despite these difficulties, Christians told BosNewsLife they remain hopeful about the future in this highly diverse nation. Tens of thousands Pentecostal and other evangelical congregations have already been established across the country, while more traditional churches are also active. Additionally, church workers want many to receive a Bible in one of the hundreds of local languages in modern-day Indonesia, where sophisticated kingdoms existed before the arrival of the Dutch, who colonized the archipelago but gave in to a bloody independence struggle in 1949. “Christ works in ways we don’t always understand,” a church worker stressed.